Teenage years are a time when children begin to move away from the family and establish themselves as independent young adults. As friends and social lives are the central focus for teens you may need to be more flexible regarding time arrangements between homes. Developmentally, teens have a tendency to be somewhat cynical about the world and when parents divorce, those feelings may intensify. Often teens will react by either rushing into intimate relationships or by avoiding commitment. Instead of trying to talk your teen out of those feelings, it’s best to present the value of learning from your experiences and to use those experiences in making choices for their own lives. Because teens are young adults, they are often exposed to more adult information than younger children. Don’t make the mistake of using your teen as a confidante or overindulging them with intimate details of the divorce. Even though they are older, they still do not want to be caught in the middle between Mom and Dad. Want to know more about the developmental needs of teens? 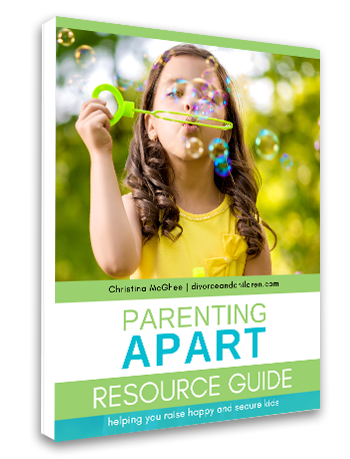 For additional information, suggested resources and practical tips, check out Chapter 13 of my book PARENTING APART, How separated and divorced parents can raise HAPPY and SECURE kids. To get a feel for what PARENTING APART has to offer, take a peek at a sample chapter. We think you’ll like what you read.